Fear is one of the basic emotions that springs automatically from a threat. It can be a real threat or a symbolic threat. A lion charging at you is a real threat. The story about a lion charging creates a symbolic threat. Our heart races in both cases. Evolution has equipped us with a fear mechanism that is triggered in circumstances where the risk of our survival is at stake. For a couple of hundred thousand years it served the purpose of focusing our attention on the threat and escaping the threat. The old proverb that says fear is your friend has a large element of truth. We don’t do a very good job of processing modern reality where the threats are new and novel. Fear like most emotions makes for an automatic, unthinking reaction. We think fast when threatened. In the case of the charging lion that is a good thing. In modern cities the chances of being attacked by a lion are small. But the chances of being run over by a bus, car or truck are much higher. But we don’t fear them. And that is a problem. I have been in Melbourne recently and have used the tram system. I noticed signs on platforms with a “Banksy-like” image of a Rhino on what looks like a skate board. (Actually Banksy used rats but his motive wasn’t to stop people from being run over by trams in Melbourne). There is a larger sign on the side of a tram depot with has the rhino ballooned up in size and with the ‘word’ rhino translated into a couple of dozen foreign languages. The sign informs us that a Tram is 30 times the size of a Rhino and you should be careful crossing Tram tracks because one of those enormous rhino’s in the form of a tram might run you down. There’s also “Beware the Rhino” facebook page which has some 3,000 likes. How can we get people’s attention so they will focus on trams when they crossed a street in Melbourne? That must have led to the inevitable series of committee meetings and public hearings, and inevitably quite a lot of money paid to an advertising agency However it happened, finally someone must have asked what are we afraid of, what ignites the fires of fear and alerts us that we might be eaten? No doubt the reply was that trams don’t eat people. That is the point. Rhinos as far as I know don’t eat people either. The room must have been jumping as to creatures that cause us to be fearful: rats, cobras, cockroaches, elephants, lions, tigers, water buffalo. No doubt there were divisions and disagreements over the appropriate animal to strike fear into the citizens of Melbourne as well as tourists coming to the city for the first time. Whatever political dealing went on behind closed doors, we know that ultimately those in support of the rhino prevailed as it is on every warning sign in the complex and extensive tram system. Whether it has reduced accidents as intended is not readily clear, but the campaign has certainly achieved a notable recognition as far as advertisement campaigns go. It has won “Postcard of the Year” award for 2011-2012. The Melbourne tram rhino got me thinking about the role of government in the fear business. Whether we like it or not, governments have two major fear related policy tools. 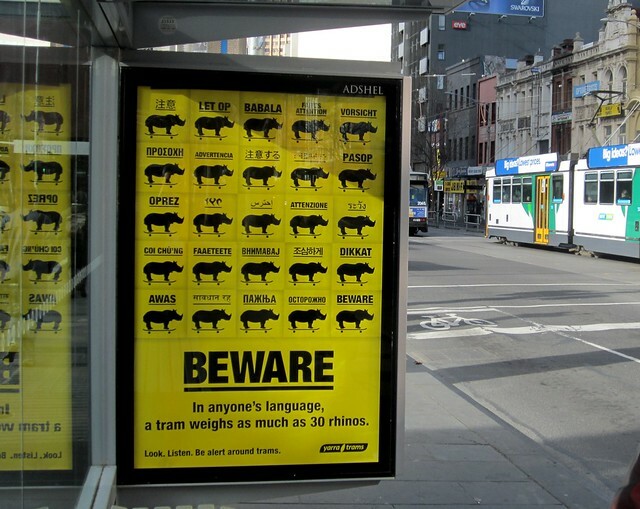 In the case of the Melbourne tram rhino, the government manufactures fear. They take an activity, a situation or an event which they believe may cause harm because citizens have not evolved a fear reaction. In these circumstances, the government’s policy is to artificially create a fear by association. Trams = 30 Rhinos. You wouldn’t want to ignore a rhino on the streets of Melbourne, would you? Of course not, then you certainly would want to pay attention to a machine 30 times as powerful as a rhino that is on the streets daily, rushing up and down like a charging wild animal. How do you feel about having the government manipulate your emotions? To manufacture your fear button even though it is for your own protection, safety and welfare? The answer is governments, pundits and private corporations do this all of the time. We become immune to fear creation. We fear our health will suffer if we don’t take vitamins though the scientific evidence is inclusively whether your daily dose of vitamins actually does anything to protect our health and extend our longevity. Pundits in the political election season pump up the fear of their audience: elect Mr. Brown to office and you will lose your right to carry an assault weapon. That means you can no longer protect yourself, your family and friends against the Rhino like crazies who threat you on the street. At night. There is a second aspect to the fear business in politics: it is fear containment. Unlike the first case where there is no natural fear and one must be manufactured, in the second case fear is irrational, and cascades through the population, and citizens demand protection. The bird flu or other contagious disease quickly spread through an Internet connected population. Governments react swiftly with vaccines, quarantines, closing schools, and providing medical advice. In this mode, the government is seeking to contain fear as generalized fear running out of control is as dangerous as the problem that ignited the fear in the first place. Public safety has always been a powerful political tool to gain votes and to cast an opponent in a negative light. No politician wants to be labelled as soft on crime. The shoe bomber is a classic case of fear containment. One man with homemade explosives in his shoes resulted in fear contagion that governments contained by restricting civil liberties of citizens. In the name of containing this fear of a shoe bomber, plane passengers by the millions remove their shoes, their belts, empty their pockets, walk through a metal detector or x-ray machine. By containing fear, governments have found a way to increase their authority and power over citizens. As far as I know, no one in government produces an annual report listing the number of shoe bombs discovered in the shoes of millions of airline passengers. One suspects they have found none. If they’d found even a single shoe bomb, that fact would have been revealed to indicate people should remain fearful and the containment policies were working. We are suckers for fear containment because it seems so reasonable to buy into at the time, and so difficult to unwind when most people agree that making and enforcing government policy based on an irrational emotion isn’t in the best long term interests of citizens. Once people look to the government to contain irrational fears, they create a monster that is more fearful that the original event that generated the initial fear that cascaded through the population. How does anyone unwind a fear containment policy once it has been funded, people hired, institutions created and inertia settle in? If you have the answer to this question, please let me know. This is a modern problem. We end up fearing the wrong things, events, and people and we pay a high price for our irrationality. Returning to the fear creation side, we can understand the role of government is once again being pitched as falling into the public safety category. Are the rhino signs in Melbourne effective? Has anyone done a comparative study with other tram systems that lack such signs or may be use a giant spider rather than a rhino to make people fearful? Because citizens don’t think much about the sign, perhaps it works on an unconscious level. We process the rhino in a part of our brain that makes us instinctively more alert to the danger of stepping in front of trams. I’ve been told the authorities in Melbourne are considering increasing the security on tram platforms at night. Apparently the evidence indicates that a tram rider is at greater risk of an assault during daylight hours than at night. But if we know one thing as crime fiction writers, it is that night is noir, and night is dark, our vision is compromised, there are rhinos in those shadows. So even though the best allocation of resources to protect public safety and welfare would be to increase security during the day, that is too rational. Our irrational mind ignores the actual evidence, and falls back on the primitive instinct that the night is always much more dangerous than the day. That’s why we invented fire. And that is probably why the authorities in Melbourne will ramp up the security at night even though they know the actual benefit will be less.